Triathlon- GO LONG… GO DEEP! 9:00 I’m posing for pictures with family and friends, loving on my daughter telling her how much I love her. She’s telling me how funny I look in my wet suit and cap but that I’m strong and I’m gonna win. We’re watching the younger age groups start and many are getting pulled from the water before making the first corner, the water is rough and on nerves. My nerves seemed to be calm, I’m happy to be finally at the starting line, ready and anxious to be out there giving it all I’ve got! 9:13 The horn blows, we’re off. The wind is howling, the size of the swell’s and white caps give a feeling of swimming in the ocean. I just try to ride up and over, kicking gently cause immediately I was kicking people behind me. A long reaching doggie paddle is about the only stroke to manage at first as we’re all on top of each, fighting to stay above water, avoiding kicking someone else or being kicked. Once we make the turn, 30 feet out everyone spreads out and those that can, take off. The rest of us are trying not to swallow too much water. I do at one point and have to roll onto my back and with no shame attempt to cough up what sounds like a lung trying to get the water out. I was a bit frazzled at the point and thought for sure I’d fallen into last place. I was surprised to lift my goggles and see that I had a large group behind me. In my mind I was smiling, gotta keep my mouth closed at this point to keep the water out and keep on swimming! 9:24 T1-I’m running out of the water and toward my bike, stripping that wet suit off as fast as I could. I felt great, super strong, and was breathing well! 9:26 Bike in hand I cross the mat, running up the hill for the bike course, the strain on my face says it all, I’m pushing with all I’ve got. 10:08 I’m back from the best bike ride of my life, I loved every mile of it, smiled for 13 miles and probably had the bugs in my teeth to prove it. I started off a little slow, following two bikers, we were trying to maneuver between the “Sprint” race runners who raced before us. Someone finally told us to get out in traffic and that’s when I took off. I don’t know how many times I announced “on your left” but it was A LOT! I enjoyed the ride so much, it was empowering passing people with little effort on my part. I had trained well for this part and it showed on the course, the hills didn’t even slow me down! 10:12 I have a slow transition from bike to run. I was chatting with my daughter and posing for pictures. I finally got my groove back and was running along the trail on the waters edge, the waves are splashing up over the wall, it was so beautiful. Hearing the crowd cheer us all on made me get a bit stronger. I didn’t want to stop in front of them, even though my legs were stiff and not cooperating from pushing so hard on the ride. I felt like a dork, stiff legged, but, I wanted to keep going till I reached the big uphill climb out of the park. Then I could walk a few minutes. The run was the hardest for me, I did manage to jog a bit, but my old knee injury was acting up, by the last ¾ of mile I was in serious pain even with my knee brace on. I did my best and coming down hill toward the finish line I could hear my rowdy friends yelling my name and mostly my daughter screaming her lungs out “GO MOMMA, I LOVE YOU!” I crossed the finish line smiling…it was the greatest day ever, they placed my medal around my neck and I was overcome with emotions, I DID IT!!! And knew I did it well. My will power has taken me to new places in 2010 and it’s only the first of August. I’ll be 42 this month and I certainly don’t feel it. The race is on, to test myself before the ball drops 12/31/2010, what else can I do? 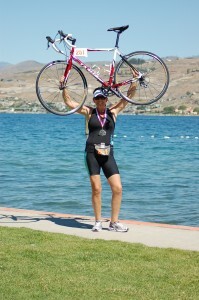 I am training hard for a Tri in September in my home town of Olympia. It’s a ¾ mile swim, 30 mile ride and a 5 mile run. In November I’m hoping to participate in a fundraiser 5k run with an obstacle course, it should be a blast, everyone dresses up in costumes and goes out to just have a great time. I have to say a huge THANK YOU to all of you at the gym who have supported my training each day in the gym and allowed me to share my journey on the blog. It’s all because a person believed in me from the beginning and didn’t give up supporting me all the way up till race day, thanks Coby. I’m proud to say I’ve lost 64 pounds, gained the lean muscle I was praying for, found my inner strength, made new friends, connected with old friends, showed my daughter what will power looks like and am still listening to her say how proud she is of me, I fell in love with working out, realized I’m not afraid of sweat but actually love it, trained for a Triathlon, and finished a triathlon. Life is grand and nothing is impossible if you just tri.